One-and-a-half miles below the icy surface of the Southern Ocean, some of the world’s coldest seawater meets one of the seafloor’s hottest environments, at undersea hot springs – known as hydrothermal vents – on the ocean floor. Recent research in the Journal of Animal Ecology reveals the private lives of “Hoff crabs” – so-called because of their hairy chest – in this remarkable environment. At this depth there is no sunlight to support life. But a lost world of deep-sea creatures thrives around the undersea hot springs, ultimately nourished by a process called chemosynthesis. Akin to photosynthesis (the process by which plants use energy from sunlight to make food), chemosynthetic bacteria use chemical energy in warm sulfide-rich fluids gushing from the deep-sea vents to build organic molecules, forming the base of the food chain in these environments. This bacterial bounty supports abundant animal populations around the deep-sea vents, and different species dominate at different distances from the sources of hot fluids, forming patterns similar in scale to those found among animals on rocky shores. Unlike rocky shores, however, ecologists cannot stroll around deep-sea volcanic vents with ease, and need to use technology such as remotely operated vehicles (ROVs) to investigate patterns of life in these environments. In 2010, a British research expedition revealed the marine life at deep-sea vents in the Southern Ocean. The species and patterns of life at these vents were different to those previously found at vents elsewhere, such as in the Pacific and Atlantic Oceans. The zone closest to where hot fluids jet from the vents is dominated by the Hoff crab (belonging to a genus called Kiwa). These crabs bustle in warm waters of around 20°C, with hundreds of crabs per square metre. To survive, they “farm” chemosynthetic bacteria on their chest hairs for food, using comb-like mouthparts to harvest them. 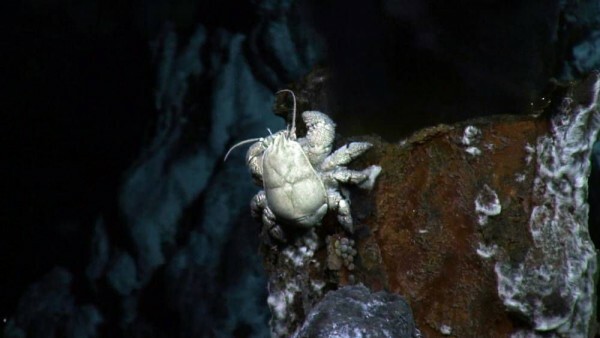 Because of the conflicting demands of feeding and raising young in the conditions at deep-sea vents, male and female crabs lead largely separate lives. 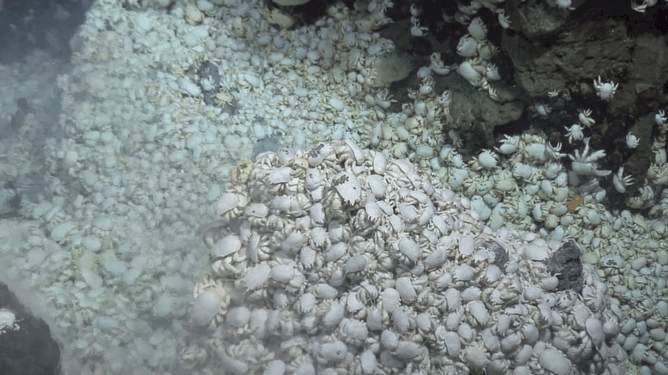 At the base of the mineral spires that form at the vents, males mingle with females in spectacular piles many crabs deep, where they get together to mate. The females then crawl away from the bustling piles of crabs and the warm mineral-rich fluids seeping from the seafloor, which can be toxic to their young. 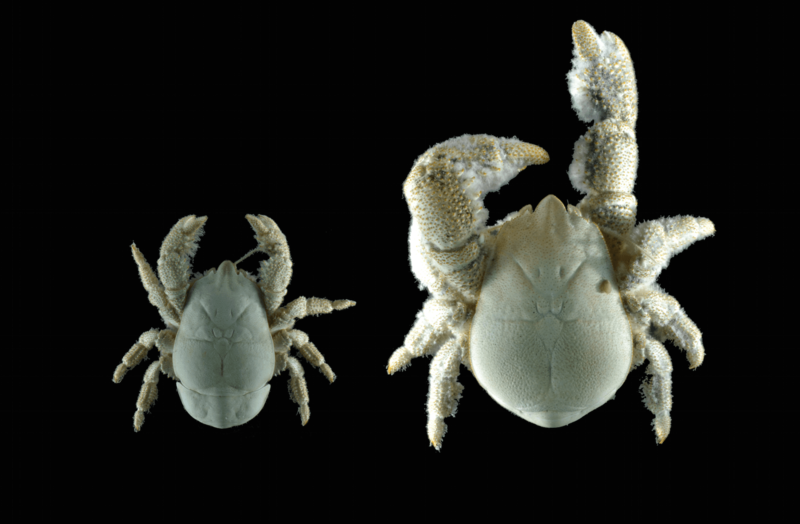 Away from the mineral spires and warm fluids, the few crabs found are either small juveniles, or females carrying developing offspring under their curled-up tails. Moving away from the warmer waters of the hydrothermal vents takes the females across a gauntlet of predators, such as large sea anemones and seven-arm seastars. Away from the vents, the cold water of the deep Antarctic also slows down the metabolism of the adult female crabs, making them less active than in the warmer waters of the jostling heaps. However, the conditions away from the vents may be more stable and less harmful to their offspring for their early development, making the journey of the females worthwhile. For the small juveniles, strength may be found in numbers. These crabs appear to be heading back towards the vents, where conditions are better for gardening bacteria on their hairy chests, providing the food they need to grow. Hundreds of these small individuals were found nestled amongst the piles of larger crabs, fighting together en masse for the warmer sulfide-rich waters provided by the vents. Males, meanwhile, don’t share in child-care arrangements with the females, and instead can climb up the mineral spires of the vents to take advantage of the warmth and conditions best suited for growing bacteria on their hairy chests – growing much larger than the females as a result. Deep-sea exploration over the last four decades, including our scientific research cruise to the Southern Ocean, has revealed that undersea vents from different regions of the world’s oceans are dominated by different species of animals, and why we find these differences remains an unanswered question in ecology – but every discovery is another piece in the puzzle.